With the onset of heat, which is accompanied by release of water from ice, a topical question of purchase of the boat. 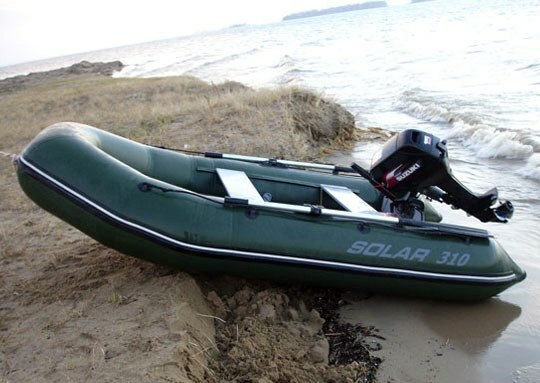 Inflatable boats from PVC are among the most common means of transportation for hunters, fishermen or tourists. Such popularity they deserve because of their availability: they provide comfort and are inexpensive. - reviews and personal experiences of other buyers. Buying such a boat, select for what purposes is the acquisition. Once you decide what will be used inflatable boat from PVCto choose the model to buy will be easier. Whether you want to be extra comfort for long fishing, additional protection for the opportunity to fish in a weedy branches places the number of places for vacationers in the case of acquisition for tourism and entertainment. Please note the manufacturer of boats from PVC. As a rule, domestic manufacturers offer a quality product at a lower price than foreign firms. So here to bring the Russian company in the black list is impractical. Import is more expensive due to extra charges for brand brand. Among the local products you can also pick up all the required tools for fishing, recreation, hunting. The larger the manufacturer and more while working in the sales market, the better his product. Well established company in St. Petersburg. If you decide to purchase an inflatable boat, a young Chinese firm, it is best to buy only proven model. Be sure to ask the consultant, of a fabric whose production made boat. The best qualities of PVC fabric, made of large leading companies, such as the German company "Mehler texnologies" or South Korean "LG Chem". Find out what type of fabric made boat which technology spikes stitches used. The more layers of polyvinyl chloride are used, the stronger the boat, but the greater its weight. Modern inflatable boats are made from seven layers of tissue with a density of 0.85 to 1.3 kg/m2. Therefore, the more layers and the denser the fabric, the more durable and wear resistant are the boat. Seams can be made by gluing overlapping or using linings from the outside or from the inside, by means of curing, ultrasonic welding or conventional bonding. The more expensive technology of seams, more reliable design. Depending on what you purchase the boat, depends on the choice of the motor. The more requirements (power-propelled speed), the more expensive the motor. Therefore, choosing a boat for various purposes, find out the characteristics of the motor. Note that the size of the inflatable boats is also of great importance. Choosing a boat, make allowances for the space occupied by the equipment motor, as well as the width of the boards. The remaining area is often half a meter of free space, enough for comfortable use of the boat by one person. If you want to fish alone, choose a boat of larger size. The bigger the boat, the less it is sustainable. Therefore, choosing a boat for fishing, ask if you can use it for fishing, standing at full height. Pay special attention check floors inflatable boats. Floors (duckboards) is made from a marine (waterproof) plywood, the edges should be dyed and framed by an aluminium profile to provide additional rigidity and structural strength. One-piece frame is preferable. It requires more careful attention and careful operation. But for the floor frame which has a folding design, in case of jamming have to use special tools to troubleshoot that in field conditions is not always available.